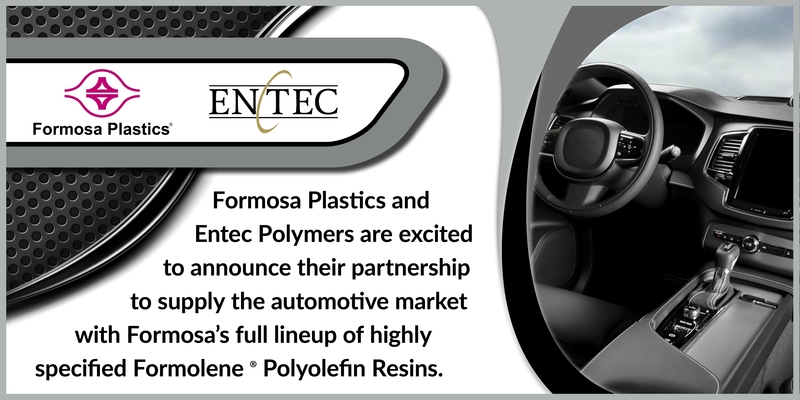 ORLANDO, FL (March 25, 2019) -- Formosa Plastics Corporation, U.S.A. (“Formosa”) and Entec Polymers (“Entec”) are announcing their partnership to supply the automotive market with Formosa’s lineup of highly specified Formolene® polyolefin resins. Entec’s team of automotive industry sellers, automotive business development managers and technical service group will partner with Formosa to provide a unique resource to both OEMs and converters. Entec has been a longtime valued partner to the automotive marketoffering a full range of application development tools, process improvement and supply chain management solutions. Formosa Plastics Corporation, U.S.A. is a vertically integrated producer of plastic resins and chemicals. Its polyethylene and polypropylene resins are marketed under the Formolene® trade name; its polyvinyl chloride resins are marketed under the Formolon® trade name. The company is headquartered in Livingston, NJ, has nearly 2,900 employees and is certified to the ISO 9001 quality management system and the ISO 14001 environmental management system. See www.fpcusa.com for additional information. View details on Formosa's Formolene® product line through Entec's product finder tool. Search and filter results by multiple product parameters, compare products and pull data sheets to find the grade you need.